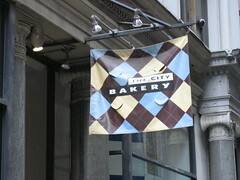 "You have to try the hot chocolate at the City Bakery," my friend said, "I can never finish it." Now, granted that he has his hot chocolates with marshmallows, but I still thought that was a pretty poor showing. I, for one, had no trouble finishing my hot chocolates on two occasions. The City Bakery is a popular cafe specialising in viennoiseries and brews, although apparently they also do salads, soups and other health foods. 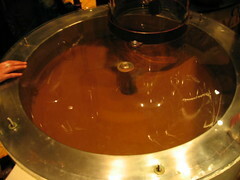 The best thing about the place, however, is the thick, luscious hot chocolate made from the molten, lava-like melted chocolate that is just poetry in motion. In general the Americans treat hot chocolate with a lot more decency than the British, but even so most of the time it's sickeningly sweet and rather insipid - a few squeezes of Ghiradelli's chocolate syrup and hot milk. While the City Bakery's version is still a bit sweeter than I prefer, the richness of their chocolate broth makes up for it, and for the ultimate morning drink, you can even ask for marshmallows, and see if you can finish it. More for the novelty than anything else, I went to try some ice cream in Chinatown. 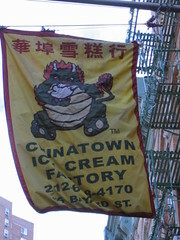 What makes ice cream in Chinatown special? Apart from the fact that after a big dimsum lunch you really just want some ice cream, there is the fact that the Chinatown Ice Cream Factory has some really unusual flavours; everything from mango and lychee, to egg tart. The egg tart ice cream tasted more like cream than egg tart, though there was a hint of custard. 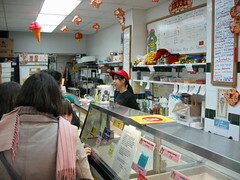 In the end, I had two scoops of lychee and mango, which, while authentically fruity, were not particularly spectacular. But, if you're in New York, chances are you'll be in Chinatown at some point, and where else would you get Zen Butter ice cream? Still on the subject of ice creams and desserts, I was watching Oprah one day (I swear, there was nothing else on; it's not like I'm not a regular fan), and she decided to feature the best frozen hot chocolate in New York City. I didn't actually remember the name of the place, but I do remember her raving about the concoction, and serving it free to all her studio audience, who were filmed looking suitably enthused (though I bet they were really wishing for a free car). 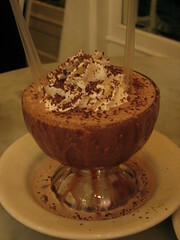 It wasn't until my friend suggested Serendipity 3 for dessert, that I saw a picture of their trademark frozen hot chocolate and was reminded that I've been wanting to try it for ages. 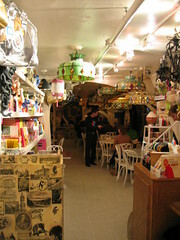 On first appearances, however, Serendipity 3 is pretty bizarre. 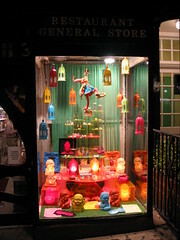 It's decorated with all manner of kitsch and queer ornaments, from odd-looking lampshades to positively creepy dolls and mannequins. Still, I'm not here for the decor, and the first thing one notices is that Serendipity 3 operates a "minimum order" policy, at a price such that every person has to order one frozen hot chocolate (or something equivalent in price). 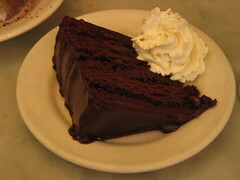 I generally think minimum order policies are a tax on people's choices, as we were pretty much obliged to order a slice of Devil's Food cake. Unfortunately I don't think this policy is going to change in the near future, so if you do go make sure you either have a big appetite or a fat wallet. Preferably both. The next things one notices is that the frozen hot chocolate is huge, and is what most Singaporeans would more naturally call an 'ice blended'. Served in a massive bowl with an enormous spiral of whipped cream, the behemoth is definitely large enough for two people to share, or maybe it was the effect of the cake, which was also rather large. 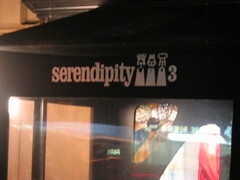 Having said that, both chocolatey treats were delicious, and Serendipity 3 is a great place to come when you're in that quirky mood that only copious quantities of chocolate can satisfy. Beware though, that the place can get incredibly crowded on weekends, and they do not take reservations. I met up with some friends of my parents, who were kind enough to take me out to dinner at one of their favourite restaurants, Morandi. 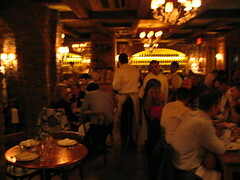 The owner of Morandi, Keith McNally, has actually opened two other restaurants prior to this one: Pastis and Balthazar. The most ironic thing is that despite Pastis and Balthazar being French restaurants, and Morandi Italian, there is nothing Continental about Keith McNally, leading one reviewer to compare his restaurants to theme parks, with European cuisines as the themes. It's true that Morandi has all the (deliberate) trappings of a rustic Italian trattoria, with exposed brick pillars, fairly chintzy lamps and wine that comes in carafes with wicker-bottoms. 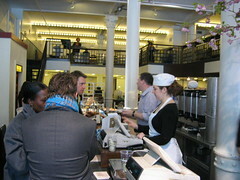 However, it's also true that McNally is clearly doing something right: all three of his restaurants are wildly popular. 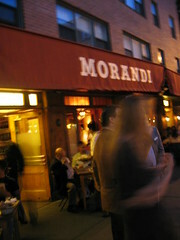 This may have something to do with the fact that he squeezes an uncomfortable number of people into his restaurants, though, as Morandi becomes somewhat deafening and claustrophobic once it fills up. My hosts were incredibly generous; ordering a surfeit of starters and pastas, in addition to our individual main courses. 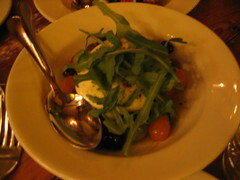 One that stood out in particular was the burrata with arugula, garnished with cherry tomatoes and olives. Rich, creamy, yet sublime, the burrata was fantastic, as were the sweet little cherry tomatoes. 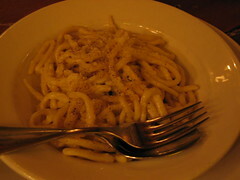 The bucatini with pecorino and black pepper was similarly excellent; al dente and plain, but not boring, allowing you to isolate the various flavours, from the salty cheese, the spicy pepper and the smooth, silkily unctuous strands of pasta. 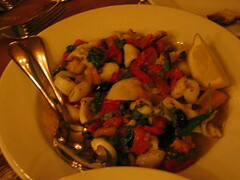 The calamari alla griglia, or grilled squid salad with peppers, capers and olives, was competent, with the squid turgid without being rubbery, but apart from that I didn't think the dish was spectacular. The hand-rolled spaghetti with lemon and parmesan, however, was somewhat overcooked, resulting in slightly soggy noodles, and in any case I felt the combination of parmesan and what was, in effect, lemon juice, didn't work very well with the pasta. After that prodigious amount of antipasti, I really should've known better than to have ordered the weekend special, but still I went ahead with the abbacchio, or roasted lamb. I tried my best to get through an enormous portion of spring lamb served with roasted potatoes, but there was really no chance. To be fair, the lamb was pretty tasty, though I thought serving a quarter rack, unchined, would have been a challenge for anyone without a chainsaw. 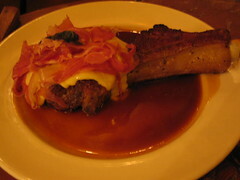 Other sizeable carnivorous servings include the roasted veal chop with prosciutto and fontina cheese, as well as chicken, pork and bistecca (for two). Of course, what stomach-bursting dinner would be complete without dessert? 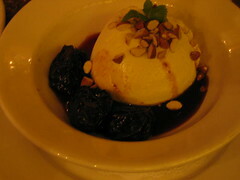 The panna cotta here is similarly large, served with honey, plums and grappa. Unfortunately, it also came with nuts, that I am extremely averse to, and that rather spoilt it for me. After having been eliminated from the competition earlier than we'd expected, I found myself with additional time on my hands. Since I had already decided to visit New York after the competition to visit some friends, it turned out I had two or three more days to enjoy this wonderful city. I had read Garlic and Sapphires, a truly delightful book by former NYT-food critic Ruth Reichl, which had got me extremely hungry just reading about restaurants in New York. I had also read Being Julia, by Julie Powell, a hilarious book chronicling her tribulations during the Julie/Julia Project, which was actually what inspired me to go out and buy Julia Child's Mastering the Art of French Cooking. So I was really looking forward to visting New York, and personally experiencing the culture of food-appreciation that seemed so pervasive. After an agonising bus ride from DC to New York, I arrived in time for dinner with some friends at a contemporary, popular, fusion restaurant, Basta Pasta. 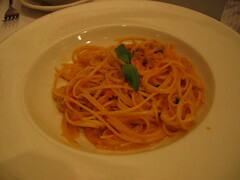 I'm a big fan of Japanese Pasta restaurants, as I believe they combine Japanese efficiency with Italian tastiness. The restaurant has a truly open kitchen; the only thing that separates it from the bar is a narrow path, allowing you to watch the Japanese chefs at work, tossing pasta and plating dishes. 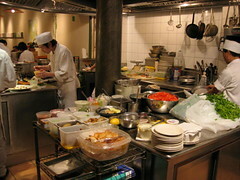 Oddly enough, despite the layout of the kitchen, no offensive odours permeate the restaurant. 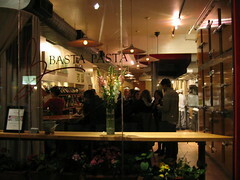 Basta Pasta is not very large, and is quickly filled to the brim, with the restaurant turning two covers in the time that we were there, so it's very advisable to make a reservation. 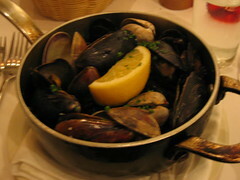 My first course was black mussels and clams, steamed in garlic and white wine. It was pretty good - nothing special; but then again it's hard to really do anything special with shellfish and white wine. Having said that it's also hard to go far wrong. 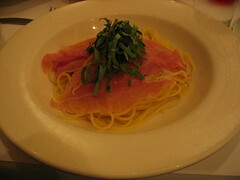 What was special, however, was my pasta dish, which was spaghetti in a parmigiano-reggiano sauce, topped with parma ham. What was interesting about this was the way it was prepared. 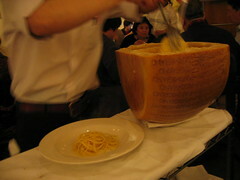 The hot pasta is first placed in the cavity of a hollowed-out wheel of parmigiano. 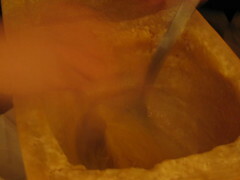 It is then mixed around inside the cavity, as the waiter periodically excavates the walls, causing bits of cheese to fall into the pasta, where the residual heat of the noodles melts the cheese. 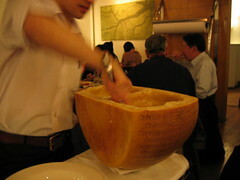 It is next scooped out of the cheese wheel, and placed onto the waiting plate. Finally, it is topped with slices of parma ham and sliced basil. 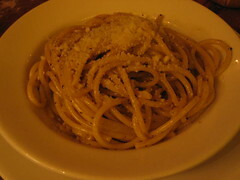 I really enjoyed this dish; the presentation was visually appealing, and the pasta itself was delicious. The ham and cheese are naturally salty, flavouring the dish without adversely affecting your blood pressure, and the melted cheese adds weight and body to the sauce. Some other dishes to try are the ever-popular tobiko-mentaiko pasta (the top picture), and the signature uni (sea urchin) pasta, which was a vivid orange hue and surprisingly sweet. I know, I know, you can find it in Singapore. But how can anyone possibly resist an entire establishment devoted to chocolate? The Max Brenner in New York is pretty massive, easily dwarfing the one back home, and unlike the Singapore outlet, this one sells all manner of sweets, pastries, cakes, drinks, chocolate syringes...it's pretty much as close to Willy Wonka's chocolate factory as you'll ever get, and you just know you can only find it in New York City. 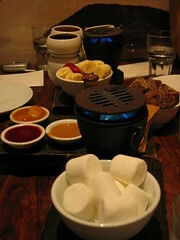 We had the chocolate fondue that, objectively, was exactly what you'd expect a chocolate fondue to be like, apart from the rather cool braziers they use. Probably not a must-visit place, but if you're in the neighbourhood, and have finished dinner early, there are worse things you could do for dessert. Okay, who am I kidding. 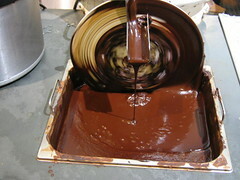 Go, if only to just stand and breathe in the wonderful chocolate aromas. And sample their free white chocolate drinks. One of the hallmarks of Ruth Reichl's time as Food Critic of the New York Times was her marked open-mindedness towards ethnic foods. 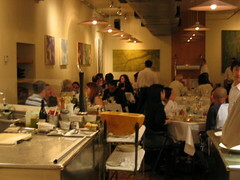 Suddenly reviews of Japanese, Indian and Israeli restaurants started taking the place of Italian and French eateries. One of her particular favourites was Japanese cuisine, and with a profusion of restaurants in New York's informal Japanese enclave, it's not hard to see why. 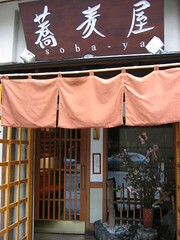 Soba-Ya is a small place that specialises in soba. When I say this, I mean their menu is almost completely made up of soba and udon dishes, though I believe they serve other things during dinner. For lunch, though, do not come here if you do not like soba. 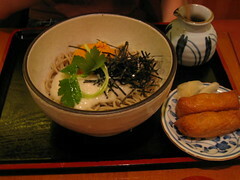 All their soba, however, is hand made, which makes it wonderfully delicate and a pleasure to eat. The soy-based broth most of the noodles come with is sweet and pregnant with umami, making you understand why in Japanese culture it's considered appropriate to slurp your noodles. 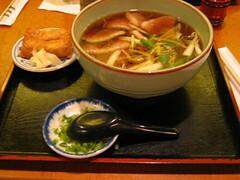 I had the Kamonanban soba, which consisted of their trademark soba served with slices of duck breast. I'm not usually a fan of Japanese cuisine, but I can well appreciate a good bowl of soba, and this was a good bowl of soba. 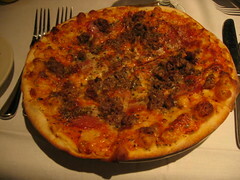 It is, however, oddly filling, so having, as I did, a late lunch, is more than likely to ruin your appetite for dinner. 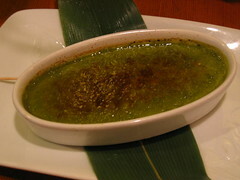 My friend swears by the matcha creme brulee, and it is in fact the only dessert he ever orders here. I thought it was a bit too soft, but nonetheless it is a good way to end the meal. I was recently in the US for a moot court competition, in which, disappointingly, we did not do as well as we had hoped, but thankfully the food more than made up for it. 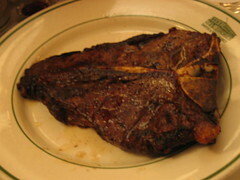 An amusing saying about DC is that "I came there as prime steak, but left as low-grade hamburger". I certainly did not, however, feel ground down by the time I left the city. While the architecture of many of the city's buildings and hotels is pretty drab, there are enough impressive monuments in the Mall and Capitol to leave one feeling pretty inspired, if not awed. While the grandiosity of, say, the World War II memorial may reek to some of unnecessary supremacism, to take in the triumphalism of the many columns, edifices and statues, all shrines to ideals and the glory of freedom (naive though it may be today), is certainly an experience. It was in keeping with such a sense of gradiloquence that we decided our first dinner should be at an expensive steakhouse. 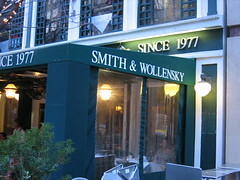 Smith and Wollensky's is a New York institution that takes its meat very seriously, as was readily apparent from some of their decor. Sadly, however, I was not terribly impressed by the experience. 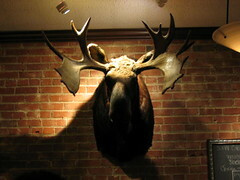 Service was strangely slow, even though the restaurant was not completely full; our meats took around an hour to arrive. The prices were also not cheap, and the sides, though advertised to be enough for two people, certainly did not seem like it (though we could just have been very hungry by then). The porterhouses were suitably hefty, but rather damningly for a steakhouse, they had either undercooked some of the steaks or had given the wrong people the wrong orders, as some of the steaks were decidedly red, when they should've been medium well. 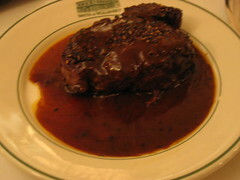 While my filet mignon was perfectly cooked, I had made the mistake of ordering it au poivre, forgetting that a heavy pepper sauce tends to utterly obliterate enjoyment of a good steak, especially a delicate cut like a filet. While the creamed spinach and french fries were enjoyable, they couldn't make up for the vague sense we all had of being underwhelmed by our first big meal in the US. 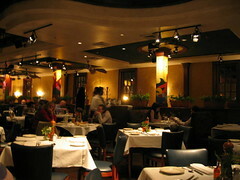 If you ever find yourself in Washington DC, and decide to head out to Georgetown for dinner on a Saturday night, it would be a very good idea to make a reservation, because almost every restaurant in Georgetown will be fully booked. This we discovered to our horror, as we wandered, hungry and increasingly ill-tempered, from door to door. Finally, we found a small Italian restaurant that miraculously had a table free. 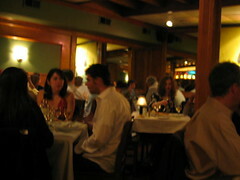 Ristorante Piccolo is a credible, if somewhat cliched, Italian eatery, complete with violin player on the weekends. 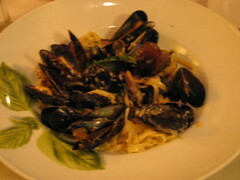 My linguine alle vongole was extremely enjoyable, though somewhat small, as portions go. 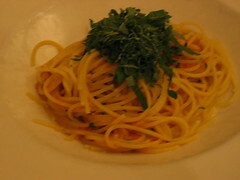 I suspect most diners tend to order pastas as starters or first plates; a suspicion that was subsequently confirmed at a later meal in New York. The fantastic thing about Georgetown is the sheer variety of food available (provided you go early, of course). Not too far from Piccolo was another of our dinner venues: Old Glory, a shining example of an all-American barbecue. Incidentally, I've always wondered why it's called an 'all-American' barbecue. How often do you come across a 'part-American, part Chinese' barbecue? I suppose it's to differentiate from TexMex, though Old Glory does offer quesadillas and tortillas. Unfortunately, I had forgotten to bring my camera, which is a shame, because I thought it was one of the best value meals we had in DC - which is not a euphemism for 'the food was not great but it was cheap'. While the prices were very affordable, the food was also remarkably tasty. 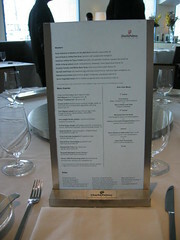 The menu is extremely extensive, offering something like a choice of ten starters, fourteen sides and twenty main courses. Best of all, they offer combination deals, for those of us (like me) too indecisive to choose between what looked like two really good main courses. 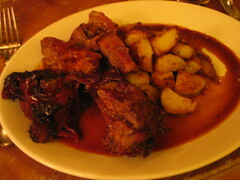 Served with two free side dishes, my combination of St Louis Ribs and pulled chicken was fabulous: a generous quarter rack of smokey, meaty ribs and a heap of tender chicken meat teased from the bone. All of us were completely full by the end of dinner, and we had a hard time staggering back to our hotel after that. Italian cuisine seemed to feature somewhat more prominently on our culinary outings, which is interesting because it seemed (along with French, though we didn't have any) the cuisine that everyone on the team could agree on. Given that we spanned six different nationalities/ethnicities and four different countries, that would make Italian food the most internationally accepted cuisine, within our highly unrepresentative group, at least. Papa Razzi is an Italian trattoria that, ironically enough, is more formalish than Ristorante Piccolo, though I suspect 'trattoria' is a term that is used these days just to sound sophisticated. The restaurant itself is pretty beautiful, it boasts a large seating capacity (with even a balcony level), ambient lighting and an open-kitchen (which can be a pain if you're sitting next to it). 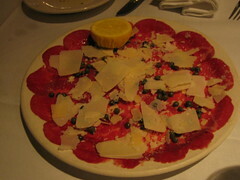 We had some carpaccio to start, which was served simply but effectively with some grated parmigiano-reggiano, some capers, and a cheesecloth-covered lemon half. I had the signature 'piccante' pizza, consisting of pepperoni, Italian sausage and mozarella, which was meaty but not as spicy as its name implied. As with Piccolo, I thought that any number of Italian eateries to be found back home in Singapore could compete fairly comfortably with the two I tried in Washington, and it may be this feature that makes Italian cuisine so internationally appealing - the fact that it doesn't require 20 years to become a great pasta chef, nor does it require three Michelin stars before your talents become recognised. After we narrowly lost to an opposing team and were thereby eliminated from the competition, we decided we had to salve our wounds by treating ourselves to another edifying steak meal. Maps can be very deceiving, and we decided to walk the forty blocks from our hotel to the restaurant. 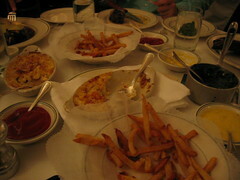 About twenty blocks away, we decided we would work up an appetite another way and simply jumped into a cab. 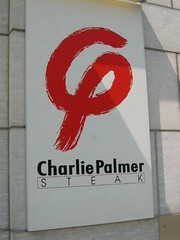 Just looking at the logo, it's easy to tell that Charlie Palmer is going to be an elegant dining experience. We came for lunch, forgetting that a steakhouse in Constitution Avenue at lunchtime is going to be full of suits, and we were rather under-attired for the occasion, but thankfully there did not seem to be a dress code. White tablecloths, large-paned windows and a wine collection suspended over a pool of beautifully clear water make Charlie Palmer Steak a visually relaxing place to have a business lunch, or perhaps a third date. The restaurant exudes confidence, something made quite clear when the waiter slots your menu, standing upright, into the metal placeholder in front of you. 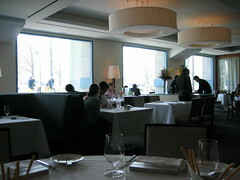 The restaurant offers a three-course prix fixe lunch menu for US$25, which I think is superb value, and those who ordered it had absolutely no complaints, and clearly enjoyed the Flat Iron steak that served as the main course. 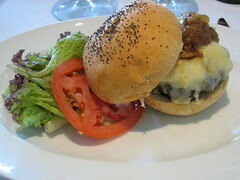 I went for the grilled Angus burger on a poppy seed roll, served with melted cheese and caramelised onions. 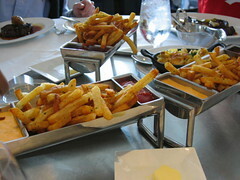 We also shared some orders of fries with chipotle aioli, which were some of the best fries I've had: crispy on the outside yet fluffy within, they paired perfectly with the spicy and tangy aioli. Succulent, perfectly cooked and juicy, the burger was a fantastic way to round off our time in DC, and there was, after all, perhaps some truth in saying I arrived with steak and left with hamburger.